The new research, led by the University of Glasgow and published today in the Journal of Experimental Biology, could have implications for areas of science such as robotics, as well as the production of climbing equipment and even tyre manufacture. Researchers found that, using their fluid-filled adhesive toe pads, tree frogs are able to grip to surfaces to climb. When surfaces aren't smooth enough to allow adhesion, researchers found that the frogs relied on their long limbs to grip around objects. When the cylinders were coated in sandpaper, preventing adhesion, the frogs could only climb the narrow ones slowly, using their grip. They were not able to climb the wider cylinders covered in sandpaper as they couldn't use their grip or adhesion. Dr. Barnes said: "I have worked on tree frog research for many years and I find them fascinating. 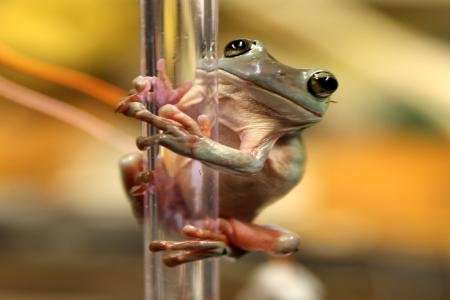 Work on tree frogs has been of interest to industry and other areas of science in the past, since their climbing abilities can offer us insights into the most efficient way to climb and stick to surfaces. "Climbing robots, for instance, need ways to stick, they could be based either on gecko climbing or tree frog climbing. This research demonstrates how a good climbing robot would need to combine gripping and adhesion to climb more efficiently." The study, "The biomechanics of tree frogs climbing curved surfaces: a gripping problem" is published in the Journal of Experimental Biology.